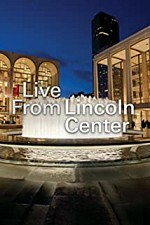 Watch Live From Lincoln Center: Filmed performances from the famous performing arts center in New York City. Episode 1 - Lincoln Center Special: Lincoln Center Festival: "A Gala Night At Alice Tully Hall"
Episode 2 - Kristin Chenoweth: The Dames of Broadway... All of 'Em!!! Episode 7 - Norm Lewis: Who Am I? Episode 3 - Lang Lang's "New York Rhapsody"